★All-AROUND FACE AND BODY CLEANING SYSTEM--A waterproof two-speed motor unit and 3 different removable brush head,from a gentle wash to vigorous deep-cleaning,give you the full range of cleansing,Keep you away from oily skin, rough skin, blackheads and allergies. 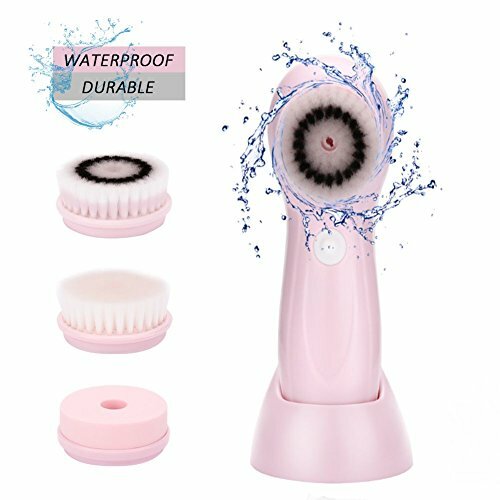 ★SAFETY AND ENVIRONMENTAL PROTECTION--The facial cleaning brush adopt USB interface to protect the environment design and the whole body is waterproof,Make sure you use it safely. ★MULTIPLE REPLACEMENT BRUSHES --The facial cleanser have 3 replacement brushes ,Clear muscle change facial brush head, brush head is fine and soft that apply to pore blockage serious, have blackhead oily skin,Soft brush head that fit for the sensitive skin,Sponge brush head Cooperate with the polishing paste, Facial cleanser, gently exfoliate.so it fit for all skin.